After Anglesey we headed back into Snowdonia for a third and final time on this trip. The weather was glorious and a mountain walk was called for. Now, we have been trying to do new stuff rather than old favourites on this trip, but I couldn’t resist a walk up Snowdon. Still by far my favourite mountain with it’s figure of eight ridges that provide exciting and exhilarating ways to the top and beautiful vistas once you get there. I know that lots of people don’t like the railway or the visitor centre, but for me they are all part of what makes Snowdon Snowdon, or perhaps I should say Yr Wyddfa. In order to make this a new experience we decided to take routes up and down that we hadn’t done before. So a plan was hatched. Overnight we stayed at Lookout Car Park. A small car park and viewpoint on the east side of Snowdon it had beautiful views into the Gwynant valley and up to Snowdon itself. We ate our dinner there and spent our time enjoying the view of the mountain in sunshine. The next morning we took the Sherpa bus to Pen-Y-Pass car park. From here we were going to ascend, not by our usual route of Crib Goch, but via Y Lliwedd. Pen-Y-Pass carpark was already full at 9am, but we saw very few people once we left the miner’s track and started up the ridge to Y Liwedd. The beautiful sunshine, occasional puffy cloud and cooling breeze made perfect walking weather – not too hot and not too cold – and the visibility meant we could enjoy the views all the way to the summit. 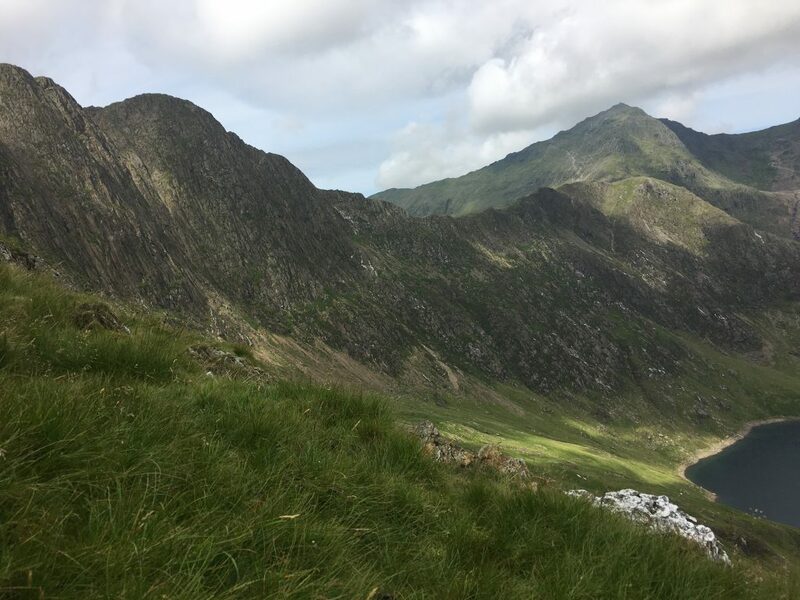 The ridge walk could be as easy as you wanted it to be, but you could also stick closer to the crest for a bit more scrambling excitement and exposure. As we looked across at the queues of people on Crib Goch we decided that this might become our new favourite route to the summit. By the time we reached the top the weather had become a little more cloudy – mist repeatedly rolled in over the summit and then rolled away again. 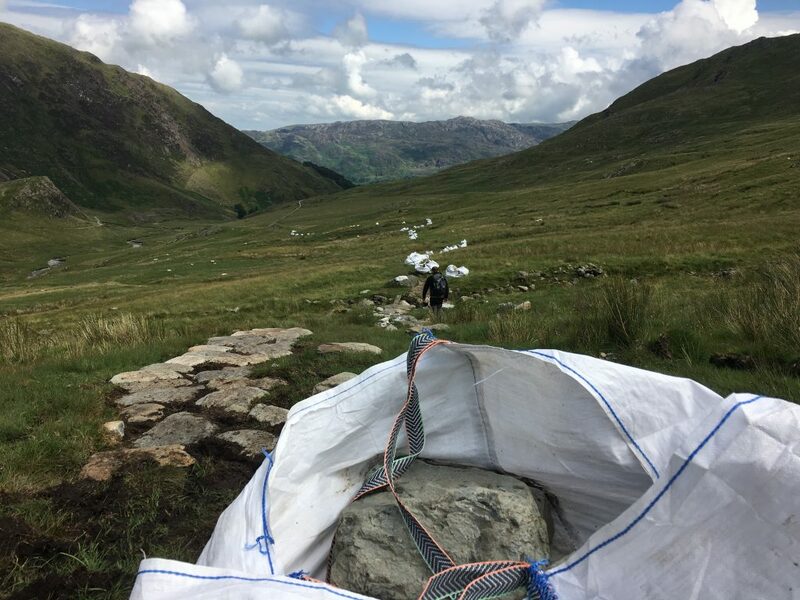 We popped in to see the visitor’s centre and café – I haven’t been in since it was renovated some time ago – it all looked very smart, but busy, and we were quickly out again to eat our lunch near the summit. Here the seagulls were diving in to try and steal food from anyone who was eating, a sign of how busy the summit was as people queued to walk up from the station to the summit to get their picture. We made our way down via the start of the Rhyd-Ddu path before turning off and heading to Nant Gwynant. A pleasant descent that avoids a lot of the scree and worn pathways of the more popular routes. There was a lot of path construction going on here, making it feel as though the path was being laid as we walked. Finally we made it down to the car park and bus stop at Nant Gwynant. 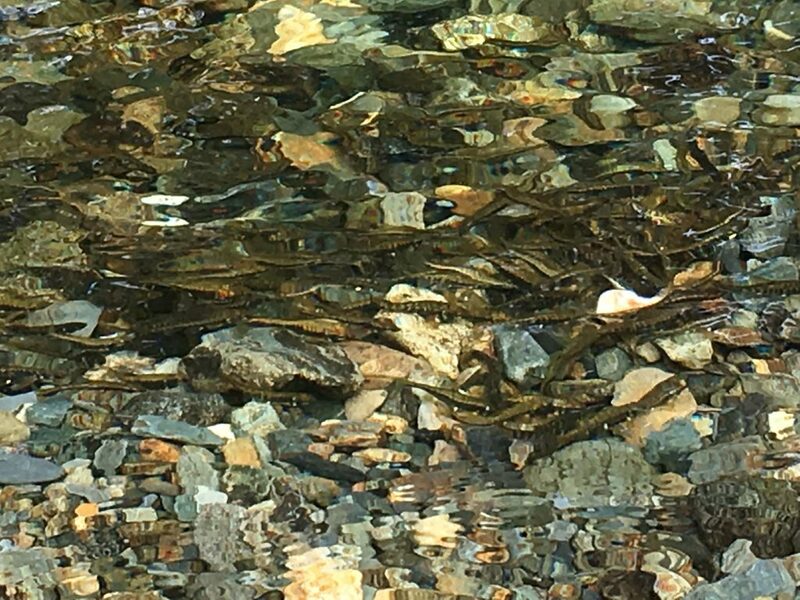 While we waited for the Sherpa bus back to our carpark we sat by the river and watched thousands of minnows swimming in the shallows as well as a couple of larger eels that relaxed in the deeper water. Using the buses had extended our options for the walk and meant we could avoid trying to fit Bertie into one of the popular car parks. At £1.50 per person per ride it couldn’t be much cheaper, something we’ll do again even if we aren’t in a motorhome. 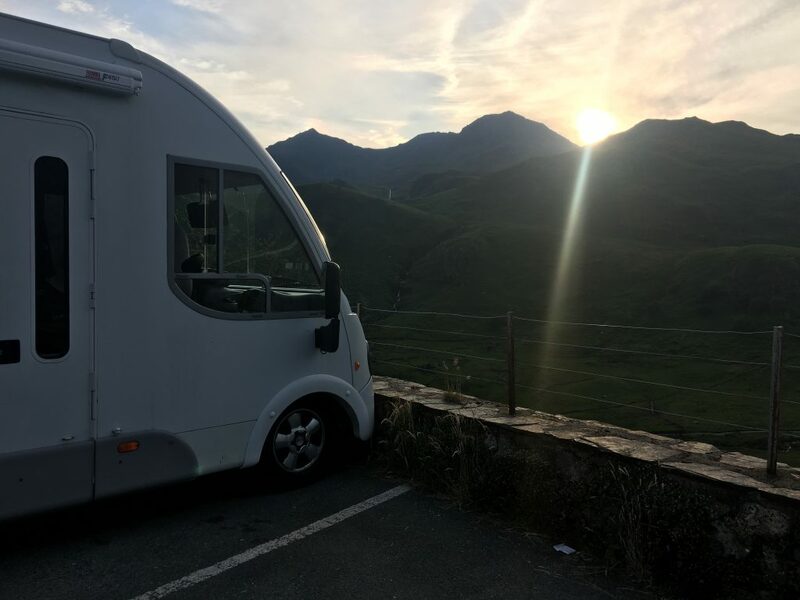 An awesome day on Snowdon was ended with a drive back to Betws-y-Coed for a pub dinner and a final overnight stop in the station car park before heading off and making our way south.